American inventor and physicist Albert A. Michelson was born in Strelno, Prussia (now Strzelno, Poland) in 1852, and immigrated to America with his family when he was three years of age. He grew up amidst the wilds of the California Gold Rush, became fascinated with physics at an early age, and studied and then taught at the U.S. Naval Academy. While still at Annapolis he first repeated and improved upon Léon Foucault's measurement of the speed of light, calculating the speed at 300,140 kilometers per second. In the 1880s he sought to measure the ether drift, the movement of the Earth through the luminiferous ether thought to comprise the universal substratum of space. He designed and built the Michelson interferometer, a mirrored beam-splitter capable of measuring almost unfathomably small distances using the length of light waves. To his own surprise, however, though the machine worked well its finding was null, and Michelson thought he had failed. In 1887 he improved his equipment and calculations in collaboration with noted physical chemist Edward Morley (1838-1923), and they conducted their famous Michelson-Morley ether drift experiment, which again came to a null result. Their finding -- or non-finding -- was widely interpreted as disproving the theory of luminiferous aether and thus challenging the fundamentals of classical Newtonian physics, a challenge that was further clarified with Albert Einstein's 1905 theory of special relativity. 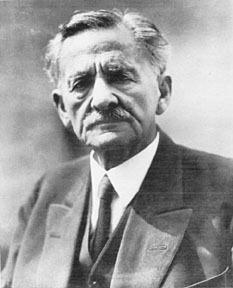 Michelson was the first American scientist to win a Nobel Prize, claiming the Physics honor of 1907 for his invention of the Michelson interferometer. In 1920 he made the first substantially accurate measurement of a star, using a six-meter interferometer attached to telescope to measure the diameter of Betelgeuse. In the 1920s he re-measured the speed of light using a more advanced eight-sided revolving mirror, finding the speed to be 299,774 km/sec, remarkably close to the now-known speed of 299,792 km/sec. He was also among the first scientists to advocate redefining the meter based on wavelengths of light.